LONG BEACH, CA – Bringing an incredible array of haunt and horror icons to Southern California for two fear-filled days of chills and thrills, Midsummer Scream Halloween Festival is set for its terror-soaked debut July 30 and 31 at the Long Beach Convention Center. Featuring more than 100,000 square feet of artisan vendors, live entertainment, specialty workshops, makeup demonstrations, screenings, haunted attraction previews and a darkened scare zone, Midsummer Scream is the brainchild of the minds behind CreepyLA and Theme Park Adventure. A highlight of Midsummer Scream will be its main stage auditorium, which will accommodate more than 1,000 horror fans gathered to witness a world-class lineup of panels and presentations, including exciting reveals and announcements for the 2016 Halloween season in California. Some of the sinister minds behind the acclaimed anthology series American Horror Story check in at Midsummer Scream to discuss the gritty world of Hotel, which aired from October 2015 to January 2016 on FX. From makeup design and effects to stunning character development and overall look, the panel will celebrate the terrifying beauty of Hotel Cortez and its other-worldly residents. An unprecedented 60-minute presentation and panel discussion on Sunday, July 31 will feature rare photographs, never-before-seen footage and ghost stories from the sprawling 160-room Victorian mansion in the San Francisco Bay Area. During the spirited presentation, Winchester Mystery Houserepresentatives will discuss the history of the property, an upcoming episode of Ghost Adventures, their recent James Van Praagh séance, brand-new Halloween Candlelight Tours, and feature film Winchester, by Michael and Peter Spierig, starring Oscar-winning actress Helen Mirren. The Museum of Paranormal History, a curated section of the show floor featuring all things paranormal, will also feature a Winchester Mystery House booth. The Museum of Paranormal History will be a unique collective of vendors, experts, authors, and local tour guides specializing in all things supernatural and including more than a dozen exhibitors. Bearded Lady’s Mystic Museum will showcase their vintage Ouija boards, ParaXplorer Project, Dearly Departed Tours, Haunted Vegas Tours, Planet Paranormal known for their wide variety of fantastic radio talk shows, Orange County Ghosts and Legends tour and paranormal investigation group, and the Winchester Mystery House will have actual pieces from the famous Northern California mansion on display – some for sale – at their booth. To ensure nothing gets out of hand, members of the Southland Ghostbusters cosplay group will be present throughout the weekend. Universal Studios Hollywood’s Halloween Horror Nights will host a presentation by the guiding force behind Halloween Horror Nights in Los Angeles, John Murdy and Chris Williams. Knott’s Berry Farmwill lift the veil and share some of its spine-tingling plans for Scary Farm 2016. 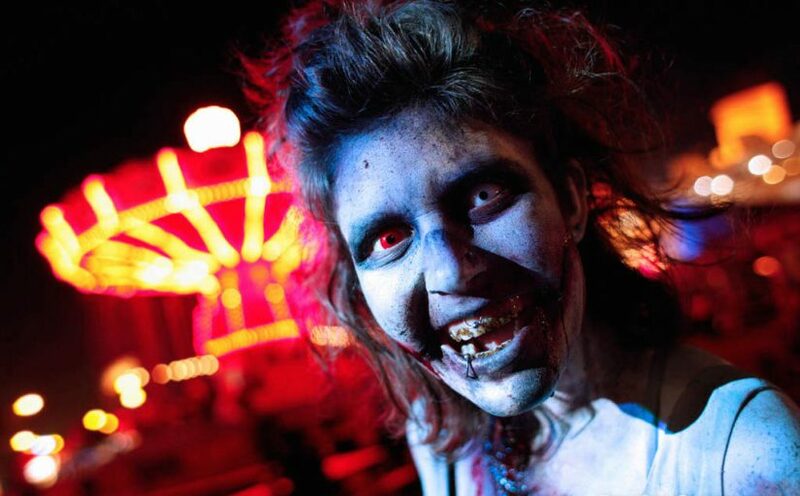 Six Flags Magic Mountain will provide fans an amazing preview of things – and screams – to come this Halloween at Fright Fest, and Queen Mary promises a major new character and maze reveal, giving Midsummer Scream fans an exclusive look at the horrors rolling in with the tide this fall at Dark Harbor. Rounding-out the paranormal offerings at Midsummer Scream will be two additional panel presentations:Haunted Theme Parks on Saturday, July 30 will delve into infamous ghost stories surrounding the attractions at Disneyland, Knott’s Berry Farm, Six Flags Magic Mountain, and Universal Studios Hollywood. On Sunday July 31, Spirits with Spirits: Haunted Bars of Southern California will be on tap, serving up a round of blood-chilling stories about the most “active” drinking holes in the region. Oingo Boingo Dance Party will headline the Noche de los Muertos (Night of the Dead) celebration and ‘80s costume contest on Saturday, July 30. With an underlying thematic style commonly centered around Dia de los Muertos, the band became synonymous with Halloween in Southern California in the ‘80s and ‘90s, performing shows at Irvine Meadows each October. Tickets to the 21 and over event, as well as a limited number of passes for a personal meet-and-greet opportunity with the band, are available now at MidsummerScream.org. Hall of Shadows will occupy more than one third of the Halloween festival’s 90,000 square-foot show floor this year, giving thousands of fans the opportunity to preview nine stand-alone home and professional haunt experiences each day. In addition to the haunted attractions, the Hall of Shadows will featureToxicity, an immersive experience by Larry Bones (creator of makeup applications and prosthetics at Universal Studios Hollywood’s Halloween Horror Nights.) Set within the walls of a genetics lab that has suffered a toxic explosion, twisted, mutated scientists will “attack” guests from all sides. Meanwhile, high-energy performances by the Decayed Brigade slider team will take place three times each day; “sliding” is a scare tactic created approximately 40 years ago at Knott’s Scary Farm where performers push their bodies and the laws of gravity to the limit to create a heart-stopping fright. For more information regarding dates and times for panels and events, and to purchase tickets, log on toMidsummerScream.org. Fans may sign up on the site for email notifications and announcements, including discounts and other special offers. This entry was posted in Haunts and tagged Gary Goddard, Jim Henson, Midsummer Scream. Bookmark the permalink. Trackbacks are closed, but you can post a comment.